At Local Government Reorganisation in 1974, Lowestoft became part of the Borough of Waveney. The operations of the Transport Department were sold to Eastern Counties some years later, and Eastern Counties is now part of First. YRT 898H is a rare combination – a 1969 AEC Swift chassis of the 2MP2R variety, with an ECW B45D body, ECW were more usually associated with Tilling fleets. The reasoning is clear, of course – support the local firm, to help the economy of the town. It is seen at Wisley on 4 April 2004. The Municipal Crest and fleetname form this second view. I have always thought that the front end of these vehicles let them down. Without the more usual Bristol RE grille, the plain front needed some alternative feature. The vertical trio of small air intake, authority crest and the winged AEC blue triangle badge just didn’t work. It would have been slightly better with the AEC badge at the top, together with a little bit of styling. The very low headlamps didn’t help, either. I bet, also, that those near vertical front screens gave rise to some serious interior light reflections during darkness hours. One of the Swifts spent some time in Somerset with Brutonian. It seemed a strange purchase for rural services and had difficulty in negotiating some of the lanes. I understand it was not that reliable. Acquired in 1978 is was used for a couple of years and it did look attractive in the Company’s colours. Who was SD and what is the coach in the background? It looks a lot smaller than the Swift even allowing for perspective. Well the close up seems to have given me part of the answer. Bedford VAM? Plaxton Panorama? But S. D. I don’t think the S&D railway (the old slow and dirty) ran coaches and they had disappeared by then anyway. TGH 769F is a Reliance 2U3RA, new to Janes, Wembley in March 1968. It’s only a guess, but SD might be Shaftesbury & District. 1968 AEC C51F new to Janes of Wembley BLOWT under More are 5 photo’s. Shaftesbury and District who have provided bus services in the area for some years. 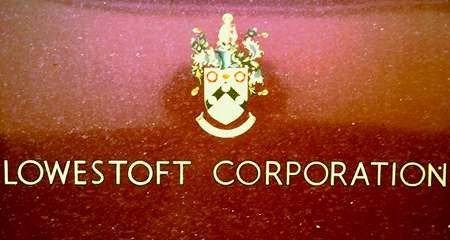 The firm started in 1976 and is still going. The photo was taken in August 1979 in Shaftesbury. A recent trawl found this photo of YRT 896H in depressing weather when it was a few months old. It shows a detail not mentioned above, that the rear end design was unlike the standard RELL bus with centre rear emergency exit, but like the RELH express bus body with an off-side emergency door and single piece rear window. Firstly the district council that took on the former Lowestoft borough area was Waveney (no r). Secondly the route licences were bought and three Bristol VRTs on order were diverted but the operation fleet wasn’t purchased. Thirdly, the advent of these Swifts in 1969 led to ECW designing the single pane rear window, previously bus-shelled dual purpose REs had three windows at the back. With regard to Stephen’s third comment, I am not aware of any dual purpose REs that had a central rear emergency exit. Perhaps there were some that I missed that were bus-shelled vehicles with sloping floors (on RELL chassis) but DP style seats. So far as I am aware all high floor (on RELH chassis) flat floor DPs had a side emergency exit. If Stephen has inside knowledge from the time, it would be interesting to know which came first the Lowestoft Swifts or the bus framed RELH DPs (eg United Counties TBD278G of May 1969). Or was it a happy coincidence? I think the vehicles that Stephen is thinking of are the two RESH DPs built for Midland General (SRB66/7F). 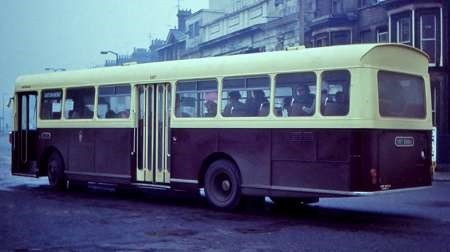 I thought a southern flavour was in order with another Southampton photo this one in service in early 1968 when the bus was quite new I am not sure of the exact location in the city. No 2 MTR 420F was an AEC Swift MP2R with a Strachans B47D body delivered in February 1968 one of a batch of five which were some 9-10 months after No 1 JOW 499E with an identical body, the ways to tell them apart was that No 1 had a red roof and a cream skirt rather than that shown on No 2 it also had a route number box above the first near/side window. These were followed by four more Swifts in 1970 this time with East Lancs who by this time were confirmed as Southampton’s body builder of choice. It’s on the junction of Portsmouth Road and Victoria Road in Woolston, Dave. She’s come from Weston Estate and is going to City Centre via Bitterne and Northam. The 8 and the 16 ran in opposite directions and the bus is turning right here because ahead of her is the bridge carrying the Southampton to Portsmouth railway line. Occasionally, drivers tried taking double deckers under the bridge, and failed to do anything other than cause the vehicle’s immediate withdrawal, hence the introduction of the compulsory right turn here. The road was lowered when the Itchen Bridge was built to replace the Floating Bridge in 1977. Several "Corporation" services ended at either side of the Itchen, and Hants & Dorset had a couple which terminated in Woolston, along with a small depot. 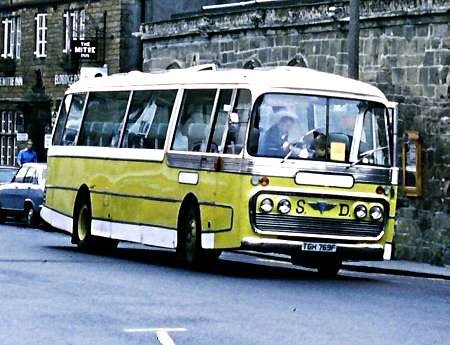 By the time I saw this bus it was in a rather sorry state – parked at the back of the Blackpool Corporation depot in April 1980 being used as a source of spares for their own fleet of Swifts. It’s nice to see this style of bodywork in a decent colour scheme. London Transport and Wolverhampton’s versions were both dreadful! I recall seeing these vehicles on my occasional forays from Portsmouth to So’ton. They had attractive bodies, in my opinion, aided by the livery. I moved from the area in 1976, the same year that saw the demise of Strachans. Your comment, Mike, confirms my thoughts that they did not have long lives, like many Swifts. No idea of bodywork quality: do you DD? The six Strachans bodied Swifts lasted a maximum of eleven years in Southampton, but a couple of them went after a mere six years. 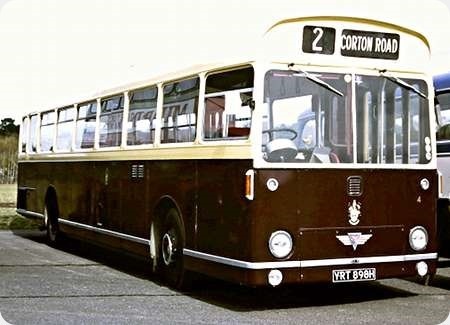 The subsequent four Swifts with East Lancs bodies also stayed in the fleet for just eleven years, so I suspect that the modest lives of these buses was due more to the shortcomings of the Swift chassis than to inadequacies with the bodywork. In fact, the Strachans body on rear engined two door single deck chassis gained quite a reasonable reputation owing to the employment of underframing that reduced the flexing movement. The Strachans examples were rather less prone to roof structure failure in the region of the centre doorway than the efforts of some other manufacturers, as London Transport, for example, discovered to its cost. One peculiarity of the Swifts in Southampton – it may have applied to the Arab UF and Nimbus fleet as well but I never got to travel on any of them, and I suspect not – was a red stripe across the roof, to match the location of the step behind the centre door. Smoking downstairs had been prohibited for several years, but was still allowed upstairs. On the Swifts, the step and stripe designated where the ‘upstairs’ was! Roof? No, sorry! I meant ceiling! I had always wondered how cigarette smoke determined where to stop blowing. It was commonplace for Smokers to be requested to occupy the rear of the vehicle on single deck buses. But how to keep the smoke from wafting into the forward section? Southampton clearly had the answer – paint a read line across the ceiling, the smoke won’t dare go beyond there. Obvious, or what !! Thx, Roger, your thoughts about the chassis rather than the body being the problem matches mine. Slightly off topic but there used to be an airline that had smokers on one side of the aircraft, non smokers on the other and this was on narrow bodied aircraft. The joke was that this must be Aer Lingus. The truth was it was Lufthansa. Just how German efficiency prevented the smoke crossing the aisle on a B737 for instance has never been revealed. KOX 663F, is an A E C Swift 505 MP2R built in 1967 with Metro-Cammell B37D+30 standing bodywork. 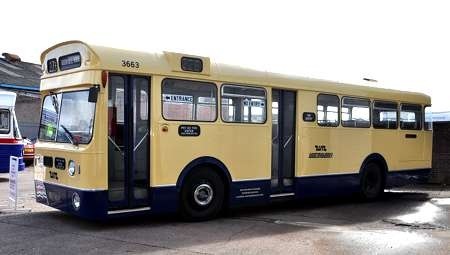 New to Birmingham and then West Midlands as 3663 it was acquired by Mid Warwickshire Motors before being preserved and has just been fully restored in West Midland livery. Another candidate for the Ugly Bus page! Top-heavy treatment of the front end…. Was this for extra headroom? ….and the side route box and blank panel/window by the exit. Does it really have no doors? Both sets of doors are open. Slightly less ugly than the same bodybuilder’s effort on the Liverpool Panthers. Doors… I can see a handrail to each right and a well-light at the bottom- but above that I look straight through the bus. Is there room on the left, obstructing the driver’s view?… Now it can be told? and one internal shot showing the standing area. Thanks Ken- looks like one flap on each side then? Ceiling marvellous shade of Nicotine, reminiscent of top decks. Is that your silver handled cane? Pity it’s ugly – certainly an unbalanced design – because it’s a superb restoration from the photographic evidence. The Liverpool Panthers might beat them in the ugly stakes but the Southport Panthers, with deeper screens, were quite handsome for their time. Not my cane and not my bus before anyone asks – they haven’t made a Swift in N gauge yet! I must be fair and agree with David: uglybus maybe, but it looks a lovely job. I have however been staring at Panthers & Swifts on this site and wonder why this bus has so much infilling between screen and peak- look at the Leeds Roes- just enough. Never mind. 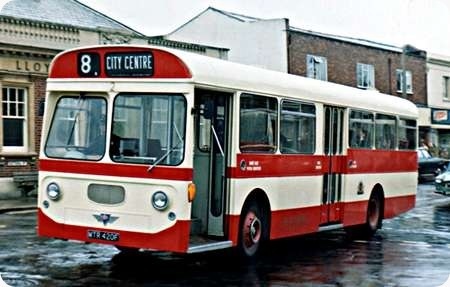 Looking at a photo of a Southport MCW-bodied Panther here http://tinyurl.com/m4xqajb, it looks like the same windscreen to me (although in the curved Manchester version rather than the Birmingham vee-form). But I can see three subtle differences which make it fit better. The blank space above the screen is split up by the way it is mounted, the front half of the bus has deeper windows and the remaining height difference is accommodated by the livery application. It just shows what a little thought can do. These buses were built to the operator’s specification using many standard parts in the interest of economy and ease of maintenance. The flat screens for example, like much of the front end treatment, are shared with the BCT double-deck fleet and were used because they were much cheaper to replace than curved ones. The shell is that used to body mainly Panthers, but also some Panther Cubs and some Swifts and is a close copy of the ubiquitous BET design. It is a great credit to the owners that they have restored this bus, which is now, and arguably always was, an interesting rarity. If we were to judge all historic artefacts on their aesthetic appearance alone, and only retain what looks nice, bearing in mind of course that beauty is in the eye of the beholder, an immediate end would be put to those interminable antiques programmes on the TV! Let’s hope that the owners don’t read the comments left here – If I were one of them, I would feel insulted. The bus does look much better in more favourable surroundings, as I’m sure that you gentlemen will agree. I’m not sure why anyone should feel insulted. 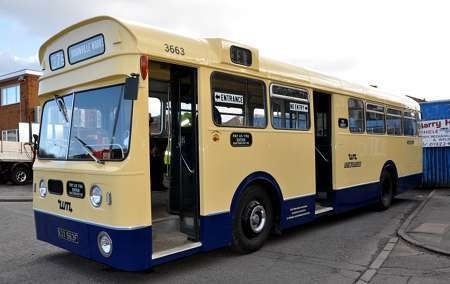 It is a most attractive restoration of a rather unpretty bus, but a lack of prettiness is no reason not to restore- or I would be rejected by the NHS! As it is, it tells a fascinating tale of fleet management, which has unfolded here- and how this and other operators resolved such questions. Consider the rather odd looking PS1 deckers-utility over looks? Or single deck Fleetlines? Bridgemasters, Wulfrunians were all unpretty but of their time. Was there a balance between appearance and economy through standardisation? Good material for discussion- so we can all be wannabee General Managers! Thank you Joe for your balanced comment. There’s no reason for anyone to be insulted by any of the comments on this link – mine or anyone else’s. There is, of course, a reason for the body being on both Swift and Panther. It’s the same bus. They shared a frame and only the engines and gearboxes were different. 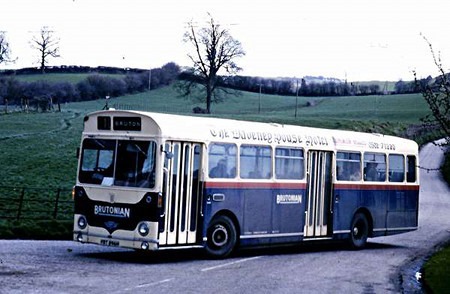 It was the first entirely new bus (in 1964) from the Leyland Motor Corporation, after the merger of Leyland and ACV in 1962. I consider this bus to be of an interesting – "different" – but perfectly acceptable appearance, especially compared to some of today’s double deckers from certain factories, vehicles which are simply a mass of incongruous bits and pieces disguised to a degree by ghastly "liveries." The Birmingham Swift’s livery is dignified and unsullied in the extreme, and the ceiling material in my view is delightfully restful and attractive and a welcome change from the almost universal garish matt white of today – I’m sure this material was chosen by BCT rather than having anything to do with nicotine Joe. Perhaps David O you should have started your thread with ‘I think it is ugly’ rather than ‘pity its ugly’ that way it is defined as your personal opinion rather than Carte Blanche opinion on the bus as clearly opinion on this bus is divided and just maybe less people may feel a little offended – just my thoughts! Clearly a lot of time, money and hard work has gone into an excellent restoration of a relatively rare vehicle. I rather like this bus and I would also agree with Ian Wild with regards to the front end treatment. I think some of the difference between this Swift and the Southport Panther are due to the fact that the Panther has a front mounted radiator and therefore needs the attractive grill fitted by Metro Cammell and also has deeper destination apertures which decreases the size of the blank panel above the screen, the deeper windows in the front part of the body also lessen the large side panels aided by the band of colour below the window line which may not look as good on the O/S. To me the use of curved screens on the Panther make little difference to the overall appearance, but the Swift’s restoration is a credit to a huge amount of time and effort by many people WELL DONE. 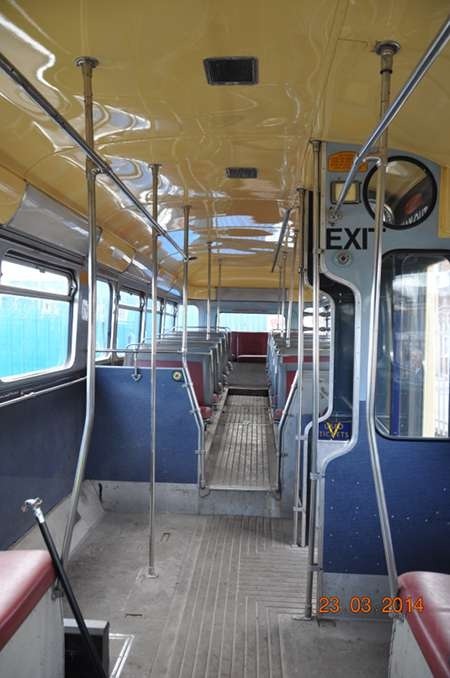 The ceiling colour is similar to that employed by LT on its Routemasters and is there to combat nicotine. This only worked in part. I used to sell a PVC/aluminium product called Tedlar which was supposed to defeat nicotine by being wipe clean but the cost of the product and the cost of cleaning was too much for the 1960s bodybuilders and operators. David’s comment about the windows being shorter than on the Southport Panther has caused me to look at this a little more closely, and I have come to the conclusion that the Swift’s body was designed very much from the inside out. The door apertures are much narrower than on the Panther, and the exit door is mounted further forward. Presumably this was to give the internal layout that the operator desired, but the result is that it would have been impossible to fit longer windows in the front half, and therefore at all (since this was well before the advent of the Borismaster ethos where every bay can be a different size!). Thanks for the interest and comments. My brother David and I funded and Trailways of Bloxwich, West Midlands, transformed the Swift. To me it’s a beauty ! No offence taken ! The walking stick belongs to Trailways owner Ron Faherty ! Well, Robert, you can both be proud of the finished product and of Trailways for doing such a fine job. I did wonder if the walking stick was something West Midlands Travel provided on all their buses to help all disabled passengers! 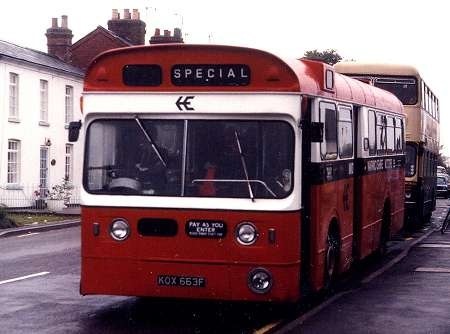 Here is KOX 663F when owned by the troubled Mid Warwickshire Motors. It is seen in Mereden on an enthusiasts’ tour. 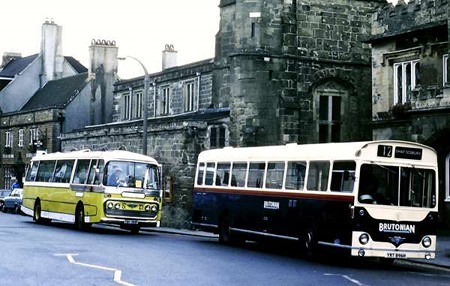 The usual stamping ground for single-decker BCT buses like this was the 27 route because it required so many low railway bridges to be negotiated – notably in Northfield and outside the Cadbury factory. 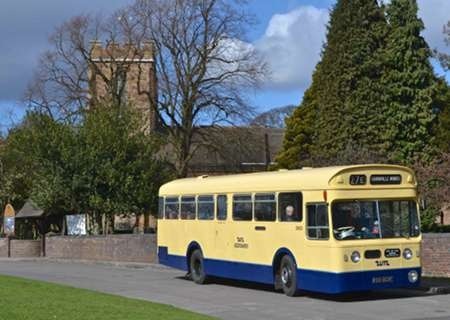 The 27 was my daily transport to and from school and during the 1960s and early 70s BCT would use the route to trial all kinds of manufacturers test offerings, asking passengers for their opinion. There were Ford R192s (BCT later bought a couple) and even on one occasion a Volvo. I think the "issues" with the frontal styling arose because the Swift chassis was (at the rear) relatively high, but this one has a low driving position. Hence the correspondingly low positioning of the windscreen, relative to the overall height of the vehicle, which needs to allow for the height of the floor in the rear section. As David O says above, the Swift and Panther used the same chassis frame, but Swifts had radiators in the side adjacent to the engine, and I believe this caused them to have higher floors at the rear. Other bodybuilders had this problem with Swifts, for example, Southampton’s East Lancs bodied batch numbered 7-10 also had an "extra" section between the windscreen and destination box.